It is often said that music has the power of bringing people together, and rock duo 18th & Addison is living, breathing proof. Consisting of New Jersey natives Tom Kunzman and Kait DiBenedetto, this punk powerhouse embodies the idea of working for what you love, with who you love. 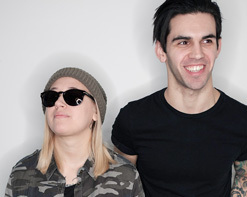 No strangers to Indie Nation, the two joined musical forces in 2013 following the eventual dissolution of their previous projects. Tom fronting pop-punk/rock outfit A Criminal Risk and Kait’s being What’s Eating Gilbert, the side project of Chad Gilbert: a founding father of legendary pop punk band New Found Glory. In fact, Kait DiBenedetto has been growing strong roots in the musical world since the young age of 16, when she was signed as one of the first recording artists on MTV’s budding new label, and began touring across the country with her band Just Kait. However, after experiencing undeniable chemistry back in their hometown of Toms River, the two reconnected to form an inevitable collaboration. After touring with what felt like a revolving door of people, the duo found a constant in each other. Years later, while performing onstage at Vans’ Warped Tour in 2017, Tom shocked Kait when he introduced the next song in their set by getting down on one knee: a proposal that rocked almost as hard as they did. This jumping punk anthem concentrates the band’s frustration and determination to keep pursuing their love of performing. Kunzman says that the music video for “Time Bomb” is inspired by the current world of goofy videos going viral and finding unwarranted fame, while musicians and bands across the country work tirelessly to keep their dreams of making music alive. This concept is illustrated comedically by a talent show devoid of any talent, each contestant worse than the last. Kait and Tom, disguised as exasperated judges, dismiss each act one by one, until the appearance of a couple of gothic punk rockers. With headbanging hairography and unparalleled verve, the punks amaze our judges and illicit a standing ovation. Of course, any listener would feel the same way after hearing this vibrant hit, as the thumping beat, unforgettable melody, and vocal harmonies will have you on your feet and rocking out. 18th & Addison’s dedication and passion is impossible to overlook. And when you combine this fervor with energetic, finely crafted rock anthems, you end up with a powerfully provocative band and a force to be reckoned with. Please don’t be shy about getting in touch to let us know what we can do on our end to get the “Time Bomb” video included into your programming and rest assured we’ll have plenty of outstanding 18th & Addison merch to set up online/on-air contests and giveaways throughout the campaign. Please contact Andy Gesner and the HIP Video Promo team at (732)-613-1779, email us at info@HIPVideoPromo.com. You can also visit www.18thandAddison.com for more info on 18th & Addison.